Chimney Sweeping has become more than just cleaning fireplaces and chimneys, and Family Chimney Sweep is proud to service all your needs. Inspections are generally done if a chimney has not been used in a long time or if you have recently moved into a new home. Inspections evaluate the structural integrity of your chimney to make sure it meets safety standards. A thorough inspection also indicates whether your chimney needs to be cleaned. A standard cleaning ensures the removal of flammable creosote from the fireplace system (chimney flue, smoke chamber, and firebox). Masonry repairs are necessary if you notice some loose bricks in your chimney. Repointing and rebuilding is not only done for aesthetic purposes, but also to make your chimney safer and stronger. Flashing — usually made of steel, aluminum, or copper — is found around the base of the chimney that meets the roof. While flashing is used to waterproof the seal between the roof and chimney, leaks often happen if the flashing is not installed properly. If you notice water stains and dampness around your chimney, the chimney flashing may need to be inspected and re-applied. Many older chimneys were built without flue liners. Never use a chimney that has not been properly lined. The lining protects your chimney from further erosion and your home from any gas leaks. We can install aluminum and stainless steel liners. Caps help keep out rain, ice, snow, animals, leaves, and other debris. Chimney caps also prevent downdrafts (when smoke from the fireplace does not exit properly). Dampers stop heat from escaping up your chimney when your fireplace is not in use. Reduce energy costs by installing a damper. Prevent a dryer fire and save on your energy bill by getting your dryer vents checked and cleaned, if necessary. If it is taking you longer than usual to dry your clothes, your dryer vent may be clogged. A longer running time equals more electricity or gas, costing you more money. Dryer vents should always exhaust properly. We will remove any animals (in a safe and humane way) that may have made a home in your chimney. We will fix any cracks, loose bricks, or gaps in the mortar of your fireplace firebox. It is not safe to use your fireplace if you notice any deterioration in the firebox. If you have another chimney problem not listed above, please call us anyway! We’ll try to solve your problem or direct you to another professional who may be able to help. Family Chimney Sweep is truly a family business. Former Boston Firefighter and Fire Inspector, Mike Scanlan, started Family Chimney Sweep nearly 30 years ago to help prevent homes from catching fire due to fireplace and chimney mishaps. His knowledge and dedication is crucial to the company’s success, and he continues to work well into his 70s. 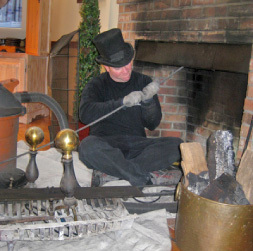 Mike’s son David has been working with his father at Family Chimney Sweep for 20 years, and along the way has learned from Mike the proper way to clean and maintain fireplaces and chimneys. David took his father’s teachings and started his own buisness, MD Cleaning, a kitchen exhaust cleaning company that specializes in preventing restaurant fires. David’s wife also helps out with the business setting up appointments and answering client questions, and his brother Mike has been known to throw on a top hat and help out during the busy season.